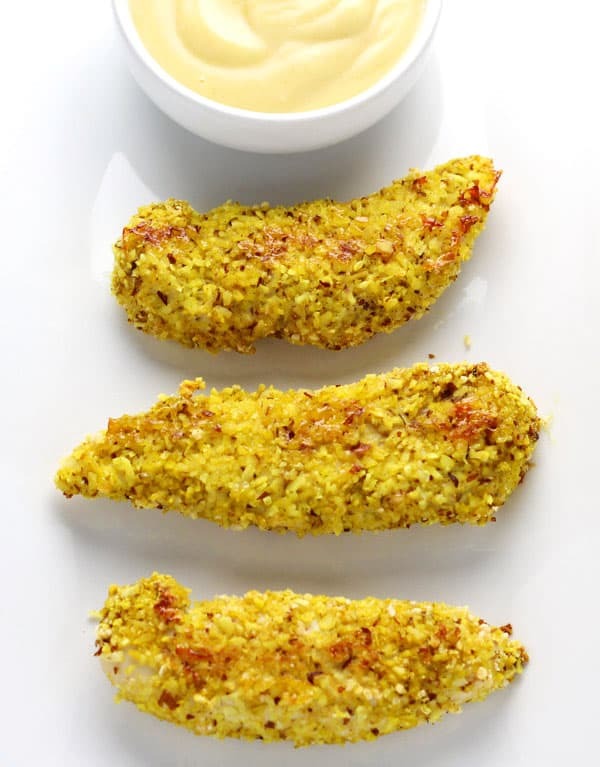 These Coconut Curry Almond Chicken Tenders (Gluten Free) are now a family favorite in our house. 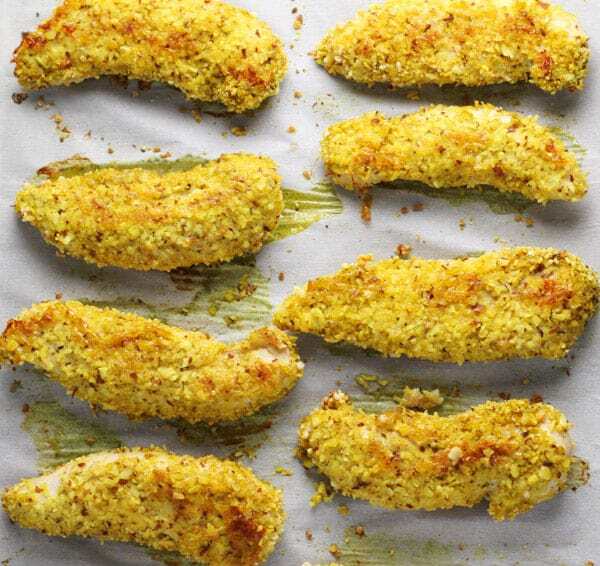 Who says only kids can enjoy Chicken Tenders! This version is adult and kid friendly! The Chicken is so flavorful and stays tender and juicy. I was a child of the 80s, which means I grew up eating lots of processed foods that probably were not very good for me. Chicken Nuggets from a certain fast food chain was one of them. Now I just try to make healthier choices for me and my son. So instead of going to some fast food place to get our nugget fix on, we now make a healthier and much tastier version at home. 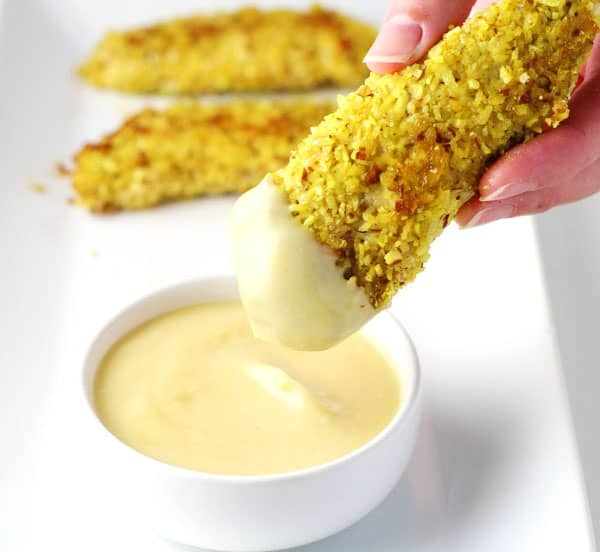 These are super easy to make too, which is perfect for those busy weeknights. I found Chicken that was already cut up into ‘Chicken Tenders’ at my grocery store. If you can’t find them already cut up you could ask the butcher to do it, or just buy boneless skinless chicken breasts and cut them up yourself. So basically I just added some Almond Slices and some Coconut Flakes to my Food Processor and pulsed them until they were bread crumb consistency. Then I added that mixture to a shallow dish (a pie pan works well), along with some Curry Powder and Gluten Free Panko. 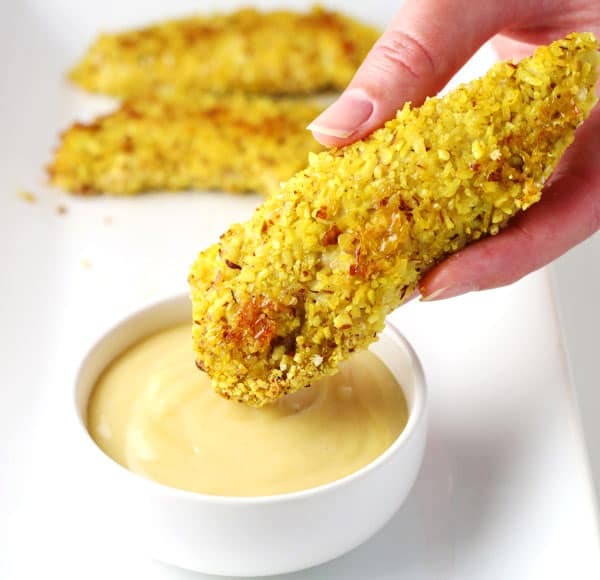 Have you guys tried Gluten Free Panko yet? This stuff is a complete life saver to us Gluten Free peeps! I only wish I had discovered it sooner! 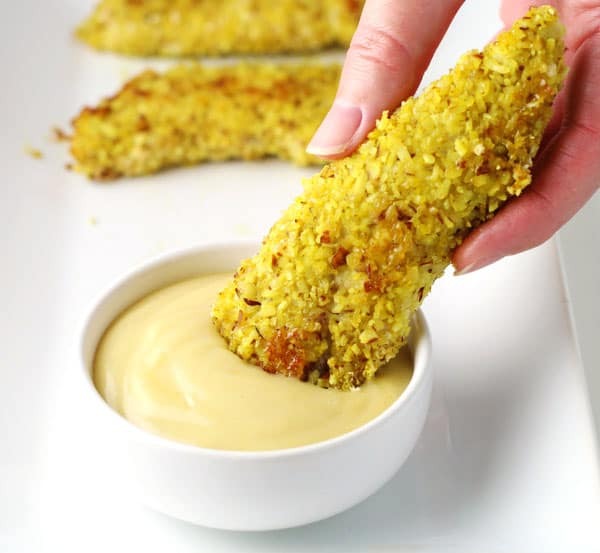 Here I thought my days of eating anything breaded were over, ha! In another shallow dish I added an Egg and Coconut Milk and whisked them together. Then I start sort of an assembly line. I add the Chicken into the Egg mixture coating all sides. Then add the Chicken to the Panko mixture coating all sides. Then finally adding the coated Chicken to a parchment lined baking sheet. Bake at 400 degrees for 30 minutes flipping Chicken half way through. Add Almonds and Coconut Flakes to food processor and pulse for 30 seconds until breadcrumb like consistency. Add Almond/Coconut mixture to a shallow dish (a pie pan works well), along with Panko and Curry Powder. Mix well. In shallow dish (a pie pan works well) add Egg and Coconut Milk, whisk with a fork until combined. 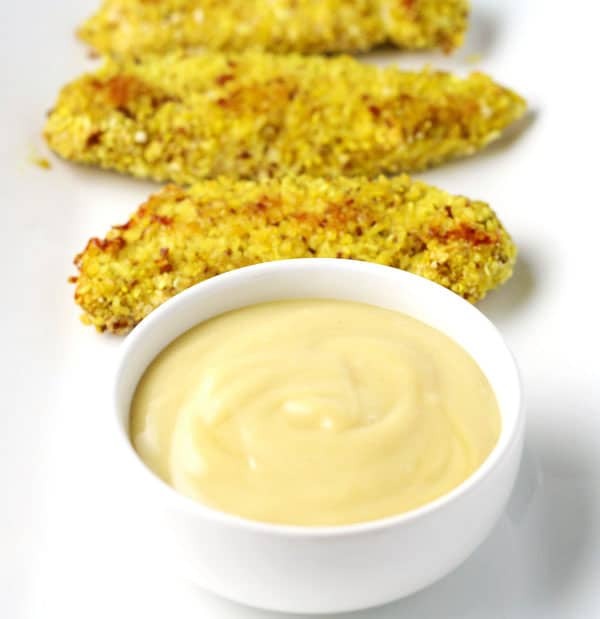 Add Chicken Cutlets to Egg mixture coating all sides. Then add Chicken to Almond/Panko mixture and coat all sides. Add Chicken to a parchment sheet covered baking sheet (if you don't have parchment paper, spray pan with non-stick cooking spray). Bake for 30 minutes turning chicken half way through. These look very good, and I’m thinking the flavors will work quite well together. Curious though, what are you dipping them in? Mustard or a flavored aioli?